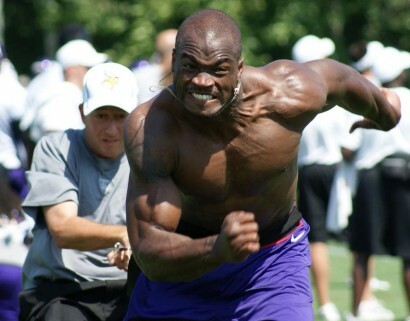 Will Adrian Peterson be the stud he once used to be? Current Average Draft Position is very user friendly. Here's our staff rankings at the running back position for the 2015 fantasy football draft. I've always used rankings to gauge the "hotness" of a player in the middle to late rounds of the draft. Rankings like these (human opinion) can be used to find rising stars that fell of your radar. See a guy on the list below that's a lot higher than you thought possible? There's probably a reason the analyst is high on them so do some research and post your comments below. We will update all of our draft rankings as needed until the start of the 2015 NFL season. Based on workload alone, i still love Jamaal Charles' workload. Waiting in the wings is Knile Davis -- a potential stud in his own right -- but the Chiefs should be looking to squeeze every last drop out of Charles as their passing attack doesn't look any stronger entering 2015. When Le'Veon Bell is available, he'll be right in the thick of things as will Eddie Lacy. Don't forget about Adrian Peterson; he should be in line for a huge workload. Look for Jeremy Hill to take the next step towards a top-5 ranking. Ranking Frank Gore was exceptionally tough this season. He's got the set-up for darn sure however his age (32) is concerning. Regardless of his age he's played in all 16 games the last four season and despite being banged up has averaged more than 4 yards per carry in each season. Gore ran against 8 or more defenders in the box a league-high 76 times last season. He won't face that type of punishment in 2015 and the only competition for snaps are Dan Herron, Vick Ballard, and Zurlon Tipton. I probably have DeMarco Murray lower than most people, but I think he will not have close to the year he had last year. He will be splitting carries with Ryan Mathews and that will drop his numbers. To me Marshawn Lynch and Jamaal Charles are at the top by themselves this year. Then I have Le'Veon Bell and Matt Forte by themselves. Jamaal Charles is the safest bet at the number one spot for my money. Eddie Lacy is a close second with Leveon Bell set to miss the first two games of the season. I'll put Peterson ahead of Bell also. I think that AP has one more season of truly elite production left in him. The fact that I have Leveon Bell at number 4 should tell you that I would have put him at the top spot if he would be available for every game this season. Rounding out the top five is Demarco Murray. I don't know what the odds are that he stays healthy for a full season again, but the results speak for themselves. Last year I drank the Marshawn Lynch Hater-Ade and I regretted it all season. I won't make that mistake again. Beast Mode is still a top to middle tier back this season. Matt Forte could see increased usage in the wake of the Kevin White injury. I'm not moving him up yet, because I think the extra touches go to Eddie Royal. If you disagree then Forte may move up your draft board a bit. Lesean McCoy could do big things in Buffalo, but there are serious questions regarding the quarterback situation. In the end, Rex loves to run the ball and Shady should be the main beneficiary. Lamar Miller was a very good value last year and I expect the Miami offense to take another step forward this season. Don't sleep on Miller. I want to be high on Carlos Hyde; he has all of the skills that a back needs to succeed. But....he plays for the 49ers who are going to be bad this year, really bad. In very limited action last year, Latavius Murray looked great. Over the course of a healthy season (if he has one), he has a ton of upside. I'm also intrigued by C.J. Spiller in New Orleans. This could be the fresh start that he needs to get back to being one of the most dynamic playmakers in the NFL. C.J. is already hurt. The injury seems minor, but I'm bailing on him. Draft with caution, he cannot stay healthy. T.J. Yeldon could be an interesting player, but he is also on the Jaguars. I realize that not everyone on the team was as bad as Toby Gerhart last year, but they do not exactly inspire confidence. Out of the Giants running backs, I would rather have Shane Vereen. His pass catching skills are top notch, but he is a better runner than people give him credit for as well. I think he gets a large share of the backfield duties right away. Ryan Mathews really took a hit to his value with the addition of Demarco Murray, but don't forget that injury history. It is not a bad idea to stash Mathews just in case. Darren McFadden could pay dividends for a savvy owner as well. I think that this is a running back by committee anyway, but if Randle goes down or struggles McFadden could sieze the job. In the later rounds, it might be worth a pick to grab Montee Ball. He has been a flop so far, but he still has skills and now he has something to prove. David Johnson downgraded with the signing of Chris Johnson. Don't bother drafting Chris Johnson, but pay close attention to David Johnson's injury status. Despite missing two games, Le'Veon Bell could still easily be the number one back. Joseph Randle could be a sneaky top 10 guy this season behind that good offense line and with an unreliable Darren McFadden. It will be interesting to see how the Texans backfield shakes out with Foster missing most of the season. Alfred Blue or Chris Polk could find some value this season.